Essayroo.com – Reliable Australian Essay Service? 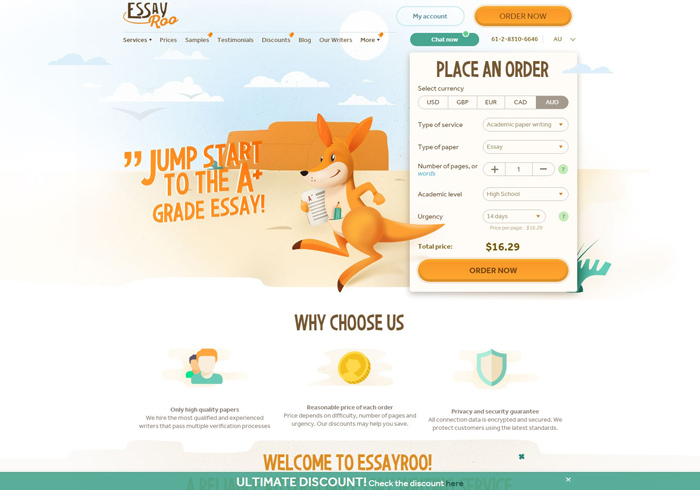 “Jump start to the A+ grade essay!” – that is the phrase that the visitor sees every time they come to the essayroo.com website. Sounds like a rock-solid promise, like a guarantee of high quality service and result for everyone who needs help with academic writing. Is everything actually that excellent? Is this academic writing online service as cool as it wants its potential clients to think? Are services that they offer really of a high quality? Read the following and see the results that we’ve got. No, it isn’t. The price is not the highest possible to see on the market, but it cannot be called as “affordable” or “moderate” one. There are services offering their help much cheaper. You might think, that such prices are the guarantee for real quality. It is good if you had an experience of cooperation with that expensive companies, and the quality of their jobs was equal to the costs they wanted you to pay. In this particular case, the situation is quite special. But the level of papers has to be discussed in an appropriate point. For the first glimpse, the design is interesting. But if to take a closer look and to analyze the interface attentively, you’ll see how uncomfortable it is. Buttons are not clearly visible; website content is a collection of SEO keywords and nothing more. The only good think about this webpage – no annoying popups. But this doubtful feature can’t save the interface with really low usability level. Here comes the main point. All other failures can be neglected by only one thing – really well-done job. But the situation here was nearly the same as with all other points. Again, everything seems to be perfect. The text of our test order did not contain serious typos, was well-formatted and grammatically correct. So, what was the deal? The whole text of the essay we received was plagiarized! Various pieces of other works were carefully combined into the complete writing, but anti-plagiarism software showed totally low uniqueness of the material. Let’s continue. Our completely copy-pasted order came to us… 25 minutes after the deadline. We don’t know the reason of such fail, and we were not going to guess. The fact that there are lots of services not dealing with deadlines even worse is not a justification here, because of plagiarism, too. It could be good. It seemed to be good. It looked good. But it is not good at all. Prices are almost two times as high as other affordable high-quality companies offer, and essayroo.com provides clients with plagiarized papers. This is weird. If you look for the really good writing service, we recommend you considering other possibilities. There are services that can give you a 100% unique material of a high quality, well formatted and fitting to your needs. And you are going to pay significantly lower price for that paper. Just don’t come at essayroo, it’s a waste of time.